The method is based on techniques developed by de Frutos et al. (20) for the light microscope with some modifications according to ref. 24. 1. Dissect and squash the salivary glands as described in Subheading 3.1.1., steps 2-8. 2. Collect and store the squashes in 70% ethanol. To spare the morphology of the polytene chromosomes, do not allow them to dry. 3. Postfix the chromosomes in 70% ethanol : formaldehyde : acetic acid (90 : 5 : 5, v/v/v) for 10 min before denaturation. 4. Wash and hydrate the squashes in an ethanol series (50%, 35%, and 20%) for 10 min each and collect them in 2X SSC. 5. Warm the squashes in 2X SSC for 2 min at 65°C. 6. Denaturate the chromosomes in 70% formamide diluted with 2X SSC at 65°C for 2 min. 7. Chill the squashes quickly in 2X SSC at 4°C. 1. Place 1 |g of DNA in a microcentrifuge tube and add sterile distilled water to 15 |L (see Note 5). 2. Denature the DNA by boiling in a water bath for 5 min, then immediately place the tube on ice. 3. Add 2 |L of DIG DNA labeling mix (10X conc. ), 2 |L hexanucleotide mix (10X conc. 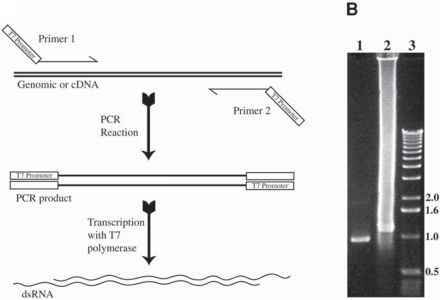 ), and 1 ||L (5 units) of Klenow fragment of DNA polymerase I. Incubate the reaction at 37°C for 1 h or overnight. 4. Ethanol-precipitate the labeled DNA and resuspend it in 50 |L of sterile distilled water. 5. Denature the DNA probe by boiling in a water bath for 5 min, then immediately put the tube on ice and add an equal volume of 2X hybridization buffer. 1. Drop 20 | L of hybridization mix on the slide, cover with a cover slip (avoid bubbles! ), and seal with rubber cement. The amount of digoxigenin (DIG)-labeled DNA probe must be approximately 20 ng per slide. 2. Incubate the slides in a humid chamber overnight at 37°C. a. Twice in 2X SSC for 5 min each. b. Twice in PBS for 5 min each. d. Three times in PBS for 5 min each. e. Twice in Genius 1 buffer for 5 min each. f. In Genius 2 buffer for 30 min. g. In Genius 1 buffer for 5 min. 4. Drop on the slide anti-DIG-Gold diluted with PBST (1 : 30) and incubate under a cover slip in a humid chamber for 1 h at room temperature. a. Three times in PBST, 5 min each. c. Six times in double-distilled water for 3 min each. 6. Incubate squashes with Silver Enhancement Reagent for 20 min, or longer, at room temperature under a cover slip. Check the appearance of the signal under a light microscope. 7. Wash the slides six times in double-distilled water. 8. Dehydrate the slides in 20%, 35%, 50%, and 70% ethanol for 10 min each. 9. Stain the chromosomes with uranyl acetate and dehydrate them as described in Subheading 3.1.1., steps 9 and 10. 10. Embed, mark and thin-section the chromosomes as described in Subheadings 3.1.2-3.1.4. 1. Dissect the salivary glands in saline solution containing 1% Tween-20. 2. Transfer part of glands to a drop (30-50 | L) of formaldehyde fixative and fix them for 20-30 s.
3. Transfer the glands to a drop (30-50 |L) of 45% acetic acid containing 10% formaldehyde and fix them for 30-40 s.
4. Squash the glands as described in Subheading 3.1.1., steps 4-6. 5. Freeze the slide in liquid nitrogen. 6. Remove the cover slip with a razor blade and place the slide in 1.5% formaldehyde in PBS (postfixative), for 30 min. 7. Collect the slides in PBS at 4°C. 1. Incubate the squashes in 0.1% BSA in PBST (blocking solution), using 50 |L per slide under a cover slip, in a humid chamber for 30 min at room temperature. 2. Gently remove the cover slip. Place 50 | L of primary antibodies (in blocking solution) on the slide and cover the squash with a cover slip (see Note 6). Keep the slides in a humid chamber for 2 h at room temperature or overnight at 4°C. 3. Remove the cover slip in PBST and wash the slide three times in PBST, 5 min each wash.
4. Place 50 |L of a 1 : 50 dilution of secondary antibodies conjugated with gold on each squash, cover with a cover slip, and incubate in humid chamber for 2 h at room temperature or overnight at 4°C. 5. Follow Subheading 3.3.3., steps 5-10. 1. Because the staining solution is saturated with uranyl acetate, this salt gives a sediment in bright light. To prevent or decrease sedimentation, add acetic acid to 0.2-0.3%. Keep it in a dark and cool place. It is possible to use the solution many times over several months. 2. To simplify and facilitate the embedding procedure, we use home-made cups of aluminum foil, as shown in Fig. 8. The most suitable thickness of foil for making such cups is 0.07-0.10 mm.